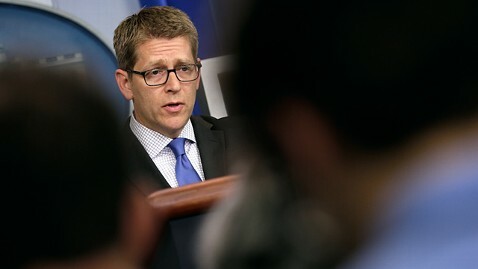 WHITE HOUSE WEIGHS IN ON ASSOCIATED PRESS PHONE RECORDS: "Other than press reports, we have no knowledge of any attempt by the Justice Department to seek phone records of the AP," White House Press Secretary Jay Carney said in a statement last night. "We are not involved in decisions made in connection with criminal investigations, as those matters are handled independently by the Justice Department. Any questions about an ongoing criminal investigation should be directed to the Department of Justice." ABC's JEFF ZELENY: The troubles are mounting for the White House - Benghazi, IRS, AP phone records - leading one administration official to ask yesterday: "Is it really still only Monday?" It's safe to say all three topics are moving into scandal territory, but it's a mistake to view them together. Of all of the controversies, the IRS seems to be the most troubling because it further erodes trust in government and institutions - from a point that is already distressingly low. At least three Congressional committees are digging in. Even though the president said he didn't know about the IRS matter until the news broke last week, it happened on his watch. Democrats could have a hard time winning this one. It bolsters the case for Republicans, just in time for the midterm campaign to begin. ABC's RICK KLEIN: It comes fast and intense in a second term. And the confluence of events - Benghazi talking points, the IRS scandal, sweeping subpoenas of Associated Press records - leave plenty of reasons to mistrust the government President Obama is leading. Knowing that Congress can't walk and chew gum very well - it can't walk all that well without the gum, and this flavor is particularly tasty to the president's opponents - this is a recipe for stalling and worse for just about anything the White House wants to do. The president's powers of public persuasion, meanwhile, could ebb in the whiff of scandals. If there's a White House strategy to turn this all around, we're not seeing signs of it, not yet. ABC's DEVIN DWYER: The talking points coming out of the State Department on Monday were astonishing for their attempted revisionism. Spokeswoman Jen Psaki repeated four times in four minutes that the Obama administration's early public characterization of the 2012 Benghazi terror attack was dictated by the CIA. "These were CIA points. They were CIA edited. They were CIA finalized," she said. Nevermind that trove of emails, obtained by ABC News, that shows it was in fact the State Department that sought to edit out the CIA's references to al Qaeda and to security warnings in Benghazi prior to the attack. "These started and ended as CIA talking points," Psaki said. Technically, maybe so. But it would be disingenuous to ignore or deny the apparent influence of State during the talking-point sausage-making that occurred in between. ABC's SHUSHANNAH WALSHE: The Tea Party groups who say they were unfairly targeted by the IRS showed ABC News questionnaires and documents received from the Internal Revenue Service. They had to answer questions about their donors, views on issues, and one member said she was even asked to show her personal Facebook account, all they say, because of their political views. The agency apologized last week, but these groups don't feel like they were directly apologized to. All want an investigation, but for Jennifer Stefano who was trying to set up a group called The Loyal Opposition, but finally gave up, she compares this scandal to Watergate: "It became very frightening, the IRS has the power to target the political opposition of a sitting president." ON THE AGENDA: President Obama spends the day behind closed doors at the White House with no public events scheduled, according to ABC's MARY BRUCE. This afternoon, Obama meets privately with Defense Secretary Hagel. -BLOOMBERG IMMIGRATION GROUP TEAMS UP WITH ORGANIZING FOR ACTION AND REPUBLICANS FOR IMMIGRATION REFORM. An announcement from the three groups this morning: "The Partnership for a New American Economy announced today that Organizing for Action and Republicans for Immigration Reform are joining the Partnership as co-sponsors of the upcoming March for Innovation (#iMarch), the largest-ever virtual march on Washington in support of bipartisan comprehensive immigration reform. The March, which is set to take place on May 22-23, will bring together leaders from politics, business, tech, sports, and entertainment to create a digital storm across a variety of social media to back bipartisan immigration legislation that will help attract and retain the world's best and brightest to fuel innovation and create American jobs. On the days of the March, participants will take part in a pass-the-baton style event that will feature a number of online venues including Huffington Post Live, Google Hangout, Twitter Town Halls, Facebook, Reddit, Livestream, and others. All of this activity will help drive hundreds of thousands of supporters to www.MarchForInnovation.com, where they will be able to use social media and other digital tools to call on their elected officials in Washington to pass comprehensive immigration reform."